The 26LN4500 is second down from the largest size in the series. 26 inches is an odd size to see lately with the emphasis on bigger and more expensive LED TVs. It is one of the only TVs for 2013 that come in this size. It is a budget set, so there aren't many features that help this one out. It isn't going to be the home theater center piece with 720p resolution and only 1 HDMI port. That's okay. This one is made to go in an office, bedroom, or even an RV. LG has realized there needs to be some quality selection in the small size category and filled the gap. The direct LED backlighting on the 26LN4500 is a little different from the edge-lit variety. First of all, it deepens the cabinet by an inch or two so the LEDs can fit behind the screen. This style of backlighting is very bright and produces a brilliant image. That's one of the biggest pros. 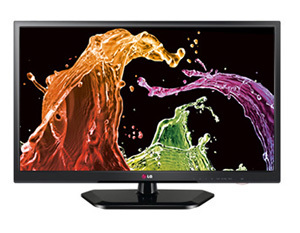 The direct LED lighting also creates bright colors and strong contrast for a budget television. Granted, the picture seen here is nowhere near the mid and top tier TVs from LG. It is supposed to create better screen uniformity as well. From what we've seen this year, it's only going to be better by a small amount if at all. Even as a budget television, the LN4500 has a few connectivity options for playing back content from other sources. The single USB port is located on the side of the TV and accepts a variety of formats. They are: DivX HD, JPEG, JPG, MPO, AC3 (Dolby Digital), EAC3, HAAC, AAC, MPEG, MP3, PCM, DTS. That leaves a lot of choice for those that have a library of digital media. TV without stand (W x H x D) - 24.5" x 15.2" x 2.9"
TV with stand - 24.5" x 17.0" x 6.4"